I'm greatly relieved to finally be posting again. I'm visiting Mary in Detroit, sitting here at her kitchen table on my laptop. I just mailed a Round 2 (wince) Mole to Aya & feel I should post my work online before she receives it. Since I am the dead weight on Round 2, I'm at a loss of what to say... not to mention I barely remember how to post to Blogger, since I haven't done so in over 4 months. So here's the truth: Round 2 drug out so long that at the very end of it, having only 2 books to complete, I lost my focus on the art exchange. Other things took my priority attention. Some not urgent but others very much so. Things like work, marriage & physical/emotional health. Then I lost something else: Steve's book. After 2 months, I finally found it 2 weeks ago -- in my piano bench, where it had been hurriedly tossed in a flurry of clean-up before houseguests. So that's the truth. My public & sincere apologies to the Round 2 group of folks affected by my poor performance, especially Steve, Aya & my poor, sweet Andrea. Now, on with the show & tell. The onions above are graphite w/watercolor wash. Steve's book was a watercolor one. Mmm, love that paper! The Picasso-like woman is what I did with Andrea's collaborative art. Andrea's circles made me think of bubblebaths, which I love. I'm a fragmented woman before a bath, which is what made me think of Picasso. Baths restore me. 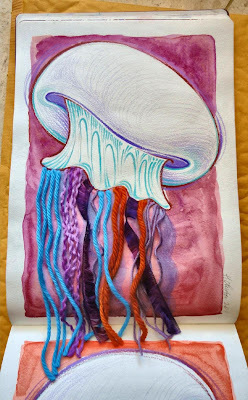 The next image is two jellyfish. The one at left is a refrigerator magnet for Steve's pocket, made from chipboard, acrylic paint, colored pencil & ribbon. The one at right, done primarily in watercolor & nail polish, is on a mostly blank page because it is a collaboration page for Aya. 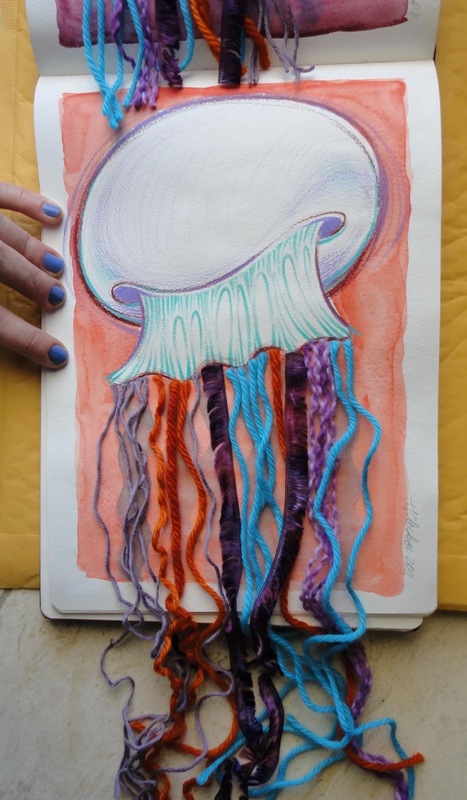 I was on a jellyfish kick this past summer. The ones I saw washed up on the beach in Florida last May really affected me. I was Googling them for further study & admiration. These jellies below have glued-in yarn tentacles, meant to dangle when you hold the book open vertically as shown. I love the jellyfish - when you first mentioned the onions I was looking at the jellyfish and thinking, hm, those onions look like jellies, but having not grown onions...what do I know? Yay! I'm so glad you are back! I really missed you! I'm to excited about you and will have to wait till tomorrow to comment on the art! 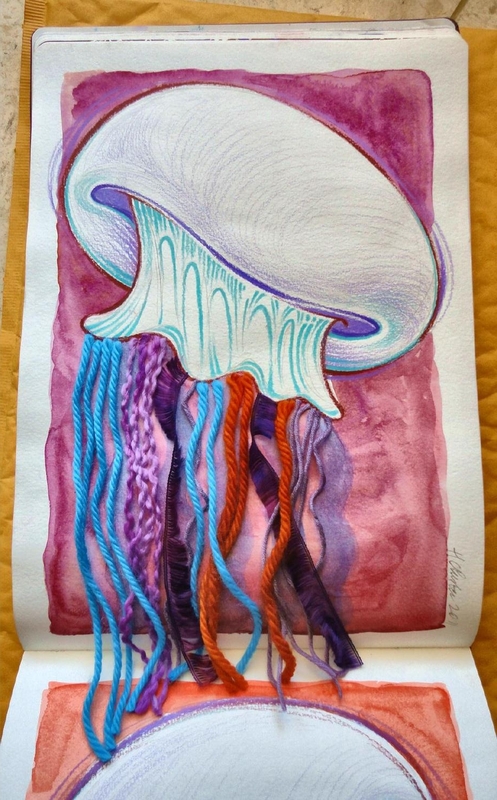 The jellyfish is the coolest. It's fun hearing about the misadventures of one of the moleskines. Must have been a lot of stress worrying about where it was. On one of my trips back from Vietnam this year, I got to the airport in Hong Kong and reached into my bag for a Mole. It was a small one that I had taken to work on. I pulled out instead the room service menu from my hotel. I was horrified. I immediately wrote to the hotel saying I'd left a sketchbook there and to please hold it for me. They wrote right back and said it had not been found. Thank goodness when I got home, I found the sketchbook in my luggage! So now I have a room service menu, too, as a memento. I love all of these! LOL! Since I had seen them in person, and commented to you directly as you created the post, I was feeling I'd already commented, which in fact, in a way, I had--and you know how I feel about all of them, but here is my public declaration: great to have you back and this is FINE WORK!!!!! AND I MUST SAY, I really enjoyed seeing the sketchbook again IN PERSON< such lovely work, everyone!!!! So glad to see you posting here again. That is crazy that Steve's mole was hiding in your piano bench. He will get a kick out of that I bet. Excellent work! Hello from 39,000 feet. I just spent a few days recruiting in Morristown New Jersey. Career Opportunities for Students with Disabilities (COSD) if you like to Google. First two pages in Ammon's book. Ellen's Moleskine is on its way to Roma! Aya's book is on the way to Mike. 2nd Set in Aya's book.